Libyan leader Muammar Gaddafi dismissed his Western partners in an exclusive interview to RT, saying he will give all the country’s oil contracts to Russia, China and India. “We do not believe the West any longer, that is why we invite Russian, Chinese and Indian companies to invest in Libya’s oil and construction spheres” Gaddafi told RT in an exclusive interview about how he sees the current situation in Libya and the international reaction to events there. "He condemned the Western powers, saying Germany was the only country with a chance of doing business with Libyan oil in the future. “We do not trust their firms – they took part in the conspiracy against us." The Libyan leader also added that as far as he is concerned, the Arab League has ceased to exist since it stood up against his country. 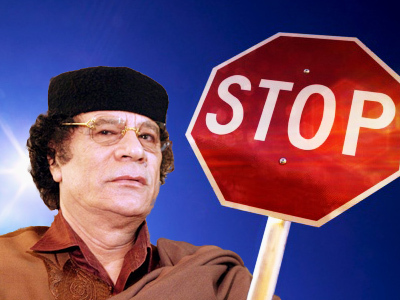 According to Gaddafi, the recent upheavals in his country were a "minor event" planned by Al Qaeda that will soon end. Meanwile, Libyan Deputy Foreign Minister Khaled Kaim promised that Libya will honor all current oil contracts with Western oil companies, but that the ongoing crisis in the country could affect future cooperation. Due to the ongoing violence, foreign oil companies have stopped production in Libya and evacuated their personnel from the country. 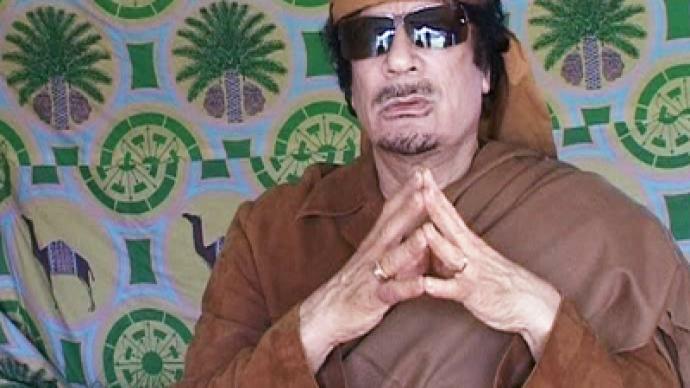 ­Muammar Gaddafi: Our situation radically differs from what has transpired in Tunisia, Egypt, Yemen, Bahrain, Qatar, Saudi Arabia and other Arab countries. What has happened and is happening in the Arab countries has nothing to do with what is going on in Libya. In those countries, their peoples protest against the authorities there, whereas our people here are demanding that the revolutionary leadership remains and implements the power of the people. The other peoples don’t have power. The power is in the hands of governments and presidents. “Down with the president! Down with the Government! Down with the Parliament!” they say. A new government is created and a new president is appointed. In Libya, power belongs to the people. We have people’s assemblies, people’s committees. The people don’t want to give up power to anyone. In some areas they’ve been confronted with bandits, few in number, who attack police stations and army barracks and seize weapons. They hide themselves in some buildings and open fire during night time, thus terrorizing the residents. They butcher people like Al Qaeda did. This is nothing other than crime. There has been an exchange of fire at some police stations between these bandits and the police. The total number of those killed is between 150 and 200, on both sides. We are dealing with something imported to us from abroad. I mean Al Qaeda. ­MG: The Al Qaeda leadership used Libya’s silence and began to tell the world about protests in Libya, about shooting and of thousands killed. All of a sudden we found out the whole world was against Libya. But we have had no protests. How could news agencies have reported such things? The number of victims is 150-200, how could one speak about thousands? How can the UN Security Council and the whole world decide, based on media reports? It becomes clear that the terrorists themselves, Al Qaeda, had sent their reports about it to the news agencies. 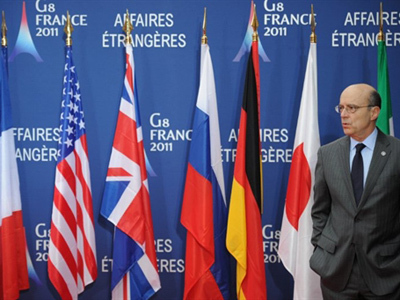 It is now difficult to change world public opinion and perception of what is going on. The situation is believed to be in crisis, desperate and problematic. As for us, we consider this not a Libyan crisis, not a Libyan disaster and not a Libyan problem. I believe the world built its stance based on reports from mendacious news agencies, and now it wants to save face in retreat. Even the US Secretary of State admitted they had been building their position on media reports. You should have sent a commission to investigate the facts and then decided. ­MG: Second, according to the UN Charter, the Security Council is not entitled to interfere in the internal affairs of any state. The Security Council should intervene in case of war between two or more states, and, consequently, in accordance with the UN Charter, Resolution 1970 is invalid. We sent an inquiry to the International Court of Justice to have this resolution declared invalid. We are opening our doors for reporters and news agencies that have been engaged in spreading those reports. Now it has become difficult for them to change their position. We are opening our doors for investigative commissions from the African Union, the United Nations, the Organization for the Islamic Conference and any other organization. MG: It is what we want because it is in our interests to let the truth be known that there have been no demonstrations in Libya. Terrorists never take to the streets to protest. Have you ever heard about Al Qaeda taking to the streets? They have no demands. True, they are in control of several buildings in Benghazi, Al Bayda and other places, they terrorize people, seize mosques and proclaim emirates, like Al Qaeda emirate and whatever emirate. Everyone appoints himself an emir of a street or house. That’s what has been going on in reality. As for the diplomats, they saw horrifying media reports that were essentially wrong. Some of the diplomats got very upset because of that. When they learned about thousands of victims in their country, they refused to remain ambassadors of their country. Others were bribed. Those who work in America are bribed by American intelligence agents and have long been recruited. Their role to give up their posts was prescribed to them. Those who were in Libya, especially in Benghazi, are hostages of the situation, even those who set up the so-called Interim Council – it does not exist. It’s just about a group of people who had never met or even known each other before, but happened to be in Benghazi when those events occurred. So they became hostages of the situation. The bandits assaulted representatives from the authorities, and told them at gun point, “Either you are with us and tell the media what we tell you to tell, or we will deal with you in the same way as did al-Zarqawi – we will cut off your head. ­MG: As you see, all are on our side, except the bandits. People are constantly appealing to us for help and to rescue them from the bandits. It is Benghazi that particularly begs for help. Well, it is true that the rebels have occupied buildings, also residential ones, for the purpose of having a human shield for themselves. We believe Benghazi can deal with them without use of our military force. 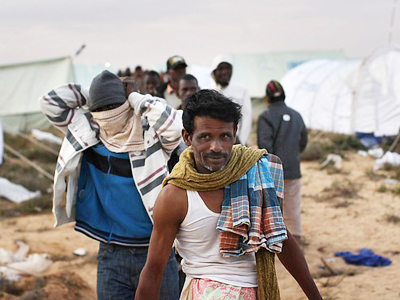 As of today, Médecins Sans Frontières declared it was withdrawing its specialists from Benghazi to send them to Egypt. People started to leave. 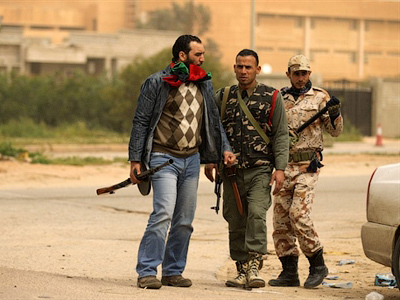 A thousand people left Benghazi yesterday, among them rebels who had committed crimes and had been in prisons. Incidentally, the rebels specifically attacked prisons to free criminals sentenced for illegal drug-dealing, killings and smuggling. The criminals were issued weapons for them to fight on the side of the rebels. All those groups have fled. I think they will be surrounded in Benghazi and give up. ­MG: As I mentioned, the world has found itself in an awkward situation and is now sorry about this. The world has learned it has made a mistake – that what has happened in Libya is fundamentally different from what has happened in Tunisia and Egypt. The international community has been able to see the people of Libya who greeted Gaddafi. All the concerns of the people are linked to the Libyan Revolution of the first of September all over the country. 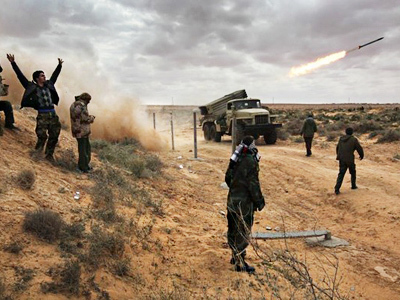 No demonstrations against the current regime in Libya have been met with fire. At the same time, Al Qaeda is really present. As I told you, other people have also been used, of course – those who just happened to find themselves there at the time to become hostages of the situation. They had happened to come to Benghazi and were forced to create the Interim Council they hoped to use to get financial and material help through. They were forced to do this and were used as tools for certain plans. What has transpired has nothing to do with the Constitution and the civil society system or civil rights. What we know is that this armed group has no interest in democracy. You know Al-Qaeda. They consider democracy godlessness created by infidels. They do not recognize democracy but do recognize only caliphates and the like. They try to force us to revise our immutable values. ­MG: We don’t trust the West anymore, so Russia, China and India will be our allies in the oil sector, construction and investments. Should the West revise their positions anyway and admit it was in the wrong and apologize – come and say, “It was my mistake, and the position I’d stuck to was wrong, and I therefore doomed the Security Council to pass the resolution despite my not having understood what was going on in Libya, and what has transpired is not worth this hype” – in this case the West should abolish Resolution 1970. If they come and apologize that they were wrong, in this case all good relations can be restored, with economic co-operation in oil production, construction and joint enterprises. They may return, but priority will always be for Russia, China and India. ­MG: I am not a conspiracy fanatic. All happened the way I told you. Now they have admitted they were wrong and began to feel confused. Why? It’s because there is no information proving there was a conspiracy in Libya. Indeed, stability, the absence of any Islamic radicalism, unrest etc – this situation in Libya is in their interests. Besides, Libya is a gate to the West from where millions of people from Africa are trying to penetrate Europe. 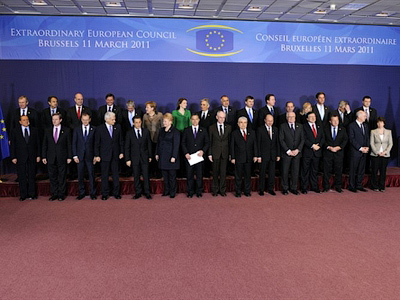 On this issue, we are in cooperation with European countries. Libya is an oil-producing country in a very important region. Nobody is interested in having problems with oil, because that will cause a price increase, which we have been observing at present. 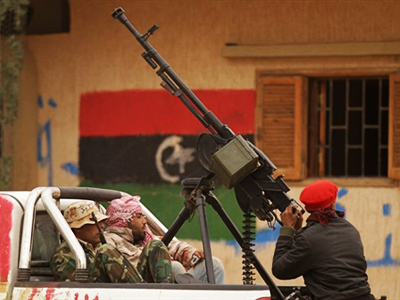 The West is not interested in unrest or destabilization in Libya. All that indicates there has been no conspiracy whatsoever or any prior plan for events to unfold in Libya. It is not in their interests that the situation in Libya changes. We have democracy. It’s democracy of the people. Libya is a key to security, and western countries are aware of the important role Libya is playing in supporting peace in Africa, in Darfur and other unstable spots. Personally, I play a significant role in establishing peace in those regions of Africa. 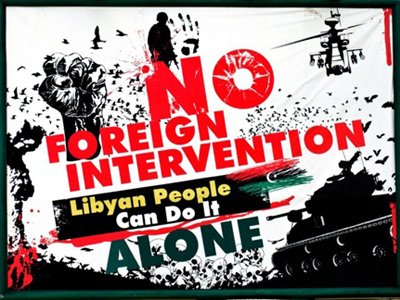 Besides, Libya has investments in Europe, so the West is not interested in provoking unrest in our country.